The Notre Dame Hounds completed their undefeated run to the 2018 Telus Cup national championship on Sunday night in Sudbury, Ont. Wilcox product Luke Mylymok had a hat trick to lead his hometown Hounds to a 5-1 win over Cantonniers de Magog in the gold medal game on Sunday. Mylymok finished the tournament with nine goals and 13 points, both tournament highs, in seven games as the Hounds ran the table through the championship, going 7-0. Notre Dame actually didn't lose a game on their entire playoff run, going 20-0 between the Saskatchewan Midget AAA Hockey League playoffs (9-0), the Telus Cup Western Regional (4-0) and the midget AAA national championship tournament (7-0). In total, the Hounds went 59-5 this season. 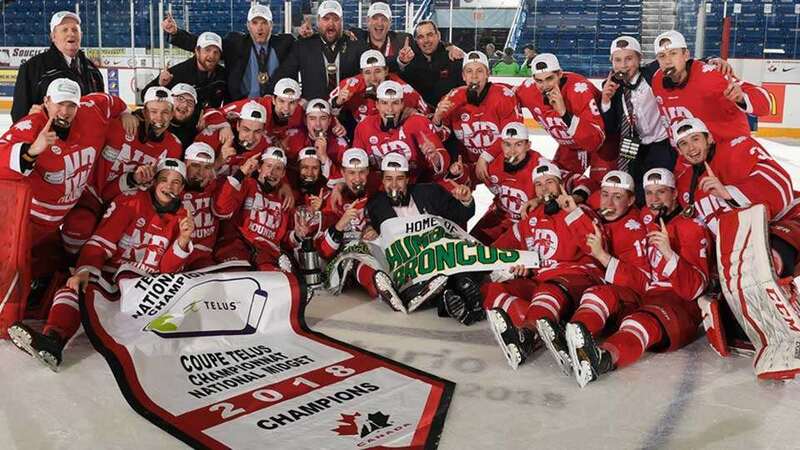 The Hounds are also the first team to win five national titles and they set the record for consecutive games at the Telus Cup without a loss with 22 straight wins. In Sunday's final, Zach Plucinski opened the scoring for the Hounds with 5:01 gone in the first period. Mylymok picked up his first of game 2:42 into the second period to make it 2-0. Ethan Ernst would add a power play goal at 12:23 and Mylymok scored his second of the game at 14:26 to give the Hounds a 4-0 lead after two. Simon Pinard got Magog on the board 3:14 into the third period, but that was as close as they would get as Mylymok added an empty net goal with just over two minutes to play to seal the win. Hounds goalie Aaron Randazzo made 29 saves in the win. The Hounds had Quinn Schmiemann win the Top Defenceman award at the tournament, while Brad Morrissey earned the Most Sportsmanlike award.